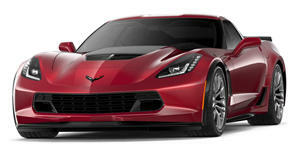 We suspect a whole lot of Z06 buyers are about to get prescriptions for antidepressants. So much breath has been wasted on speculating just how the next chapter in Corvette history would be written. Would it be a mid-engine Ferrari 488 GTB killer? Would GM realize that the 650 horsepower thrown to the rear wheels is already on the outer edge of what the chassis can handle and call it quits with a few special editions? Nay, because Chevy set the precedence for the ZR1 back in a not so inconspicuous 2007 press release, and the C7 ‘Vette just had to follow. Those aren’t easy shoes to fill either as the Z06 already has wicked power, aggressive aerodynamics, and a reputation on the block for making a Porsche 918 Spyder buyer feel silly for paying eight times as much for their car. After seeing this heavily camouflaged C7 ZR1 making rounds on the track, we can confirm that this trend will continue. Equipped with a massive rear wing and a front end aerodynamics that seem to both glue the car to the track and provide engine cooling through gaping vents, the driver takes no prisoners, taking anger out on the throttle with the assurance that their grip budget won’t soon be spent. With the ZR1 looking stable through high g corners, the yaw seen when approaching the apex gives a hint at just how hard the brakes bite down, a boon to us exhaust note lovers because it means the driver can spend more time canning the throttle. Grab some popcorn and enjoy this because you won’t hear an exhaust like this on the twin-turbo V6 Ford GT.